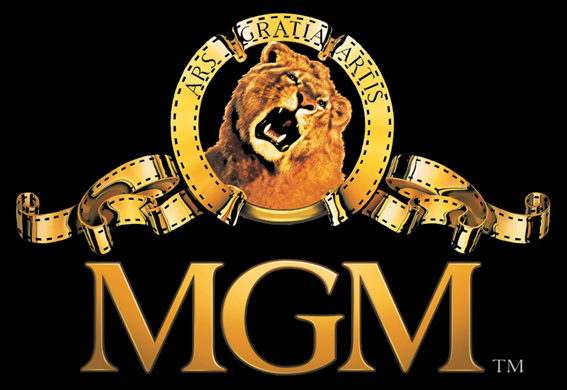 From FlixChatter comes word that MGM, the grand-daddy of film studios, is filing for bankruptcy. Now, most of us probably don’t pay much attention to the studio that produced the movie we’re watching, but suffice it to say you’ve probably seen a zillion of MGM’s films. Think about how many times you’ve heard that lion roar, and pause a moment. Ruth wants to know what our five favorite MGM movies are. And I can’t precisely do that, because, well … here’s the thing. MGM is responsible for THE musical. Like, the golden age of musicals. The pretty-much-everything-Gene Kelly-ever-did musical. Plus some of the other greats, like Judy Garland and Howard Keel. So I’ve had to come up with a list of my five favorites PLUS all of the MGM musicals I’ve seen, all of which (pretty much) I adored. So here you go … and MGM? Thanks. Welcome to the first installment of “Movies you simply must see”, otherwise known as “Movies I loooove”! Yes, the extra Os are necessary. These movies will, for the most part, be movies that I probably consider my favorites, with a few exceptions: basically, if they’ve been included already in some other list (see: Master & Commander), I won’t bore you by writing another post about them. Anyway, the movie I’ve chosen for this “inaugural” post is Amelie (or Le fabuleux destin d’Amelie Poulain). Seriously, if you have not seen this movie, stop what you’re doing, add it to your Netflix queue, head to your local library, or do whatever you have to do to get hold of it, and watch it immediately. Or at least this weekend. No, it doesn’t matter in the slightest that the movie is French (it has subtitles). I will brook no refusal! I was reminded of Amelie (not that I really need reminding) by a post that came through my RSS feed in which someone was making “Amelie’s famous plum cake,” which is apparently a traditional French recipe (which she makes it in the movie), and I had the urge to do just what I encourage you to do: drop everything, etc. I own this one, so I guess it’d be easier for me, but still. I asked two friends if they’d seen it, and neither had, so I’m hoping they will get on that asap! I gushed about it to them, but for the sake of writing a post, I’ll try to come up with some concrete reasons why it’s so very, very great. 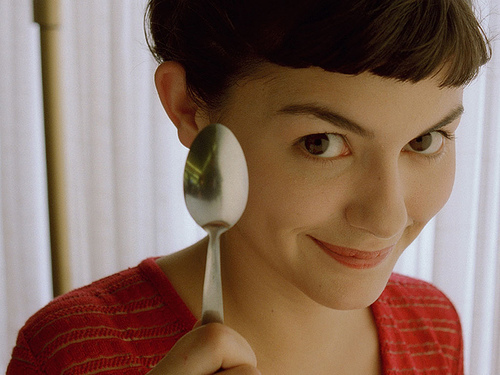 Amelie is the story of a lonely young woman (Audrey Tatou) who waits tables and lives an otherwise quiet existence. She is, however, a very imaginative person, and all that she really needs is to break out of her shell. She accomplishes this by engaging in various projects designed to help (or in one case, harm, gently) the people in her sphere: co-workers, neighbors, family members, even total strangers. In so doing, her world begins to open up, and in the end, her “good deeds” come back to her, and she finds love. That’s a really brief synopsis. The projects that she undertakes are totally creative, often hilarious, and in some cases reasonably complex. Throw in a couple of minor mysteries, a whole lot of whimsy and romance, some of the most gorgeous cinematography and color you’ve ever seen, excellent acting across the board, and you’ve got a sort of “real world” fairy tale that I guarantee you will fall in love with. Tatou is completely charming in the lead role; her every expression speaks volumes and you will have a hard time separating “Amelie” from Audrey. In fact, I often wonder how much separation there really is. The supporting cast, none of whom you’ve probably heard of (although Mathieu Kassovitz, the positively adorable [IMO] love interest, pops up in interesting places from time to time) are all outstanding as well. This film is just beautiful. I don’t know how else to describe it. It’s stylish and colorful and has exquisite attention to detail, both visually and textually, and it’s just this delicious confection of a thing. The best way I can sum it up for you is that half the time when I watch it, I sit back as the credits roll and I think to myself “…I could watch it again.” J’adore, j’adore, j’adore. I mean it. If you like visually pleasing movies, if you like sweet stories, romance, any of that … watch this movie ASAP. And please let me know what you think when you do. I know some people who refuse to see it for various reasons (most of them silly) and I wish they would, because I just don’t believe that anyone could not like this film.